Vision Basics: How Does Your Eye Work? Eye Basics - Vision Basics: How Does Your Eye Work? It’s all about light. Light reflects off an object, and if that object is in your field of vision, it enters the eye. The first thing it touches is a thin veil of tears in the front. Behind this is your eye’s front window, the cornea. This clear layer helps focus the light. After the aqueous humor, light passes through the pupil. This is the central round opening in your iris, the colored part of your eye. It changes size to control how much light gets in farther back. Next up is the lens. It works just like a camera to focus light. It adjusts shape depending on whether the light reflects off something near to you or far away. This light now pierces the center of the eye. It’s bathed in moisture from a clear jelly known as the vitreous. Its final destination is the retina, which lines the back of your eye. It’s like the screen in a movie theater or the film in a camera. The focused light hits cells called photoreceptors. Blood vessels bring nutrients to your nerve cells. The macula is the bull's-eye at the center of your retina. The dead center is called the fovea. Because it's the focal point of your eye, it has more special, light-sensitive nerve endings, called photoreceptors, than any other part. Photoreceptors come in two kinds: rods and cones. They’re special nerve endings that convert the light into electrochemical signals. Retinal pigment epithelium (RPE) is a layer of dark tissue beneath the photoreceptors. These cells absorb excess light so the photoreceptors can give a clearer signal. They also move nutrients to (and waste from) the photoreceptors to the choroid. The choroid is separate from the RPE. 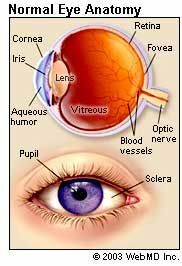 It lies behind the retina and is made up of many fine blood vessels that supply nutrition to the retina and the RPE. Sclera is the tough, white, fibrous outside wall of your eye. It’s connected to the clear cornea in front. It protects the delicate structures inside the eye. Signals from the photoreceptors travel along nerve fibers to the optic nerve. It sends the signals to the visual center in the back of the brain. And that’s how you see: Light, reflected from an object, enters the eye, gets focused, is converted into electrochemical signals, delivered to the brain, and is interpreted, or "seen," as an image.